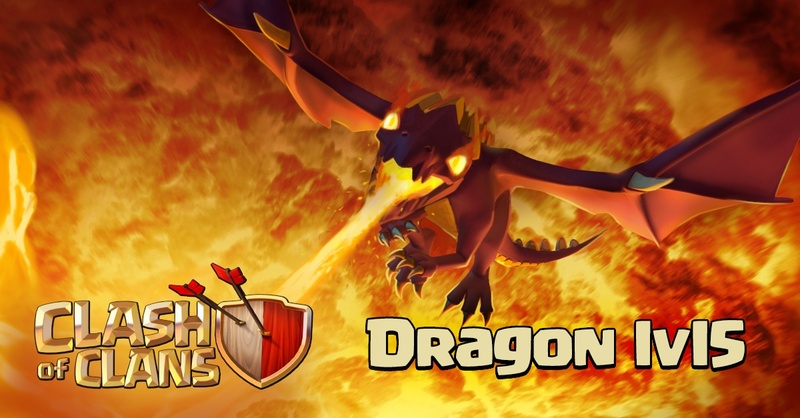 The Dragon is one of many Regular Troops in the Clash of Clans game. The Dragon is a fearsome flying unit and is capable of attacking both ground and air units. Unlike the Balloon, the Dragon is both ranged and deals splash damage, like the Wizard. Also unlike the Balloon the Dragon does not target a specific Building to attack; he targets whatever is nearest. A Dragon does short-range splash damage when he attacks. This can only be noticed when used against Clan Castle troops and Walls. 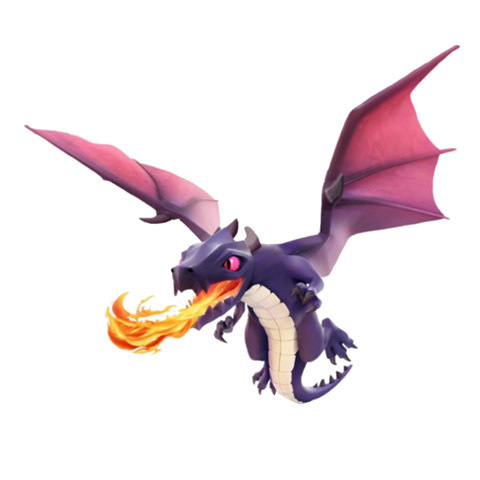 The purple Dragon icon shown in the Barracks is actually a level 2 Dragon. The Dragon changes from green to purple after upgrading, matching its image in the Barracks. Dragons have no preferred target when attacking; they will simply attack the closest building to them. However, once they become aware of enemy Clan Castle troops, Heroes or Skeleton Trap skeletons (either by being attacked themselves or being near another friendly Troop under attack), they will leave their previously targeted building and engage the enemy Troops instead. Once all of the nearby enemy Troops are defeated, they will proceed to attack the nearest building from their current location. Description of common tactics of usage a Dragon on a battlefield is Here. 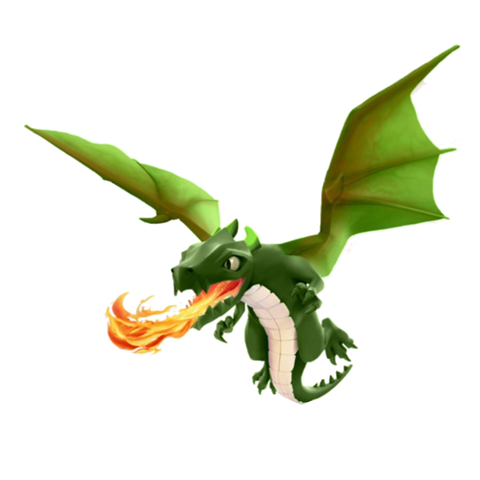 Level 1 Dragons have green-colored skin and black eyes. At level 2, the Dragon’s skin turns from green to purple, matching his image in the Barracks. His eyes also turn the color of elixir. 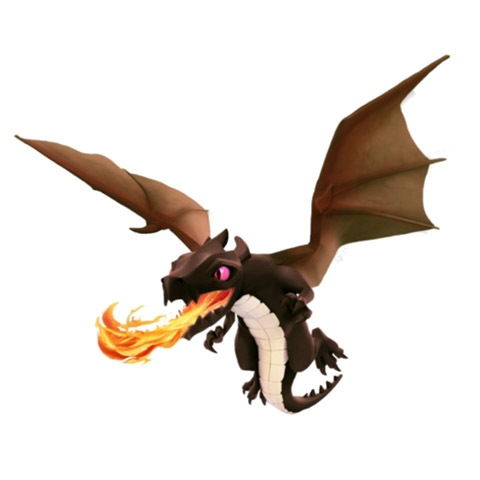 At level 3, the Dragon’s skin changes again to dark grayish-brown. At level 4, the Dragon’s skin turns a deep red; as part of the update announcement, Supercell referred to it as the new “ancient red dragon.” His eyes also start flaming. At level 5, the Dragon obtains golden horns near the back of its head and spikes on its back. Its wings also gets larger. The first person to have reached over 4,000 (Jorge Yao) used an all-Dragon army to do so. He used 4 Lightning Spells as support, one to take out Clan Castle troops and the rest to destroy an Air Defense. This was his way to ensure 50% damage practically every time he attacked in order to become the top player and achieve this wonderful feat. You can have a maximum of 12 Dragons at one time in a complete set of fully upgraded Army Camps. This number increases to 13 if you include the 1 that can fit into a level 3 or higher Clan Castle. The Dragon’s attack was given a splash damage component as of the 12 March 2013 update, making them much more powerful against groups of ground troops. The Dragon received new art as of the 23 May 2013 update; the new Dragon receives forelegs along with a line of small spikes down its neck and back. This new look is often debated among fellow players to which one looks the ‘best’, along with the P.E.K.K.A. The Dragon has a pair of paws and fire in his mouth since the 23 May 2013 update. The appearance has also been changed to a robotic like creature. A Dragon’s shadow is oval, not dragon-shaped. The Dragon’s upon-death skeleton is person-shaped. The Dragon is one of only two troops to have different appearances at every level (along with the P.E.K.K.A). The Dragon is one of only two troops of which the picture in the Barracks resembles an upgraded troop, the other being the Wall Breaker. 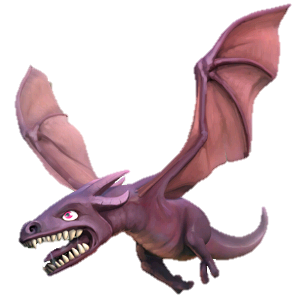 The Dragon is one of the five air troops (along with the Healer, the Minion, the Lava Hound and the Lava Pup) that never stop flapping their wings, as they cannot land. The level 3 and 4 Dragon has a very thin see-through line going through the base of the wing. However, this is barely noticeable. The January 2013 update added Dark Elixir, stating that this resource is formed over aeons from fossilized Black Dragon (i.e. then-maxed level 3 Dragon) bones. 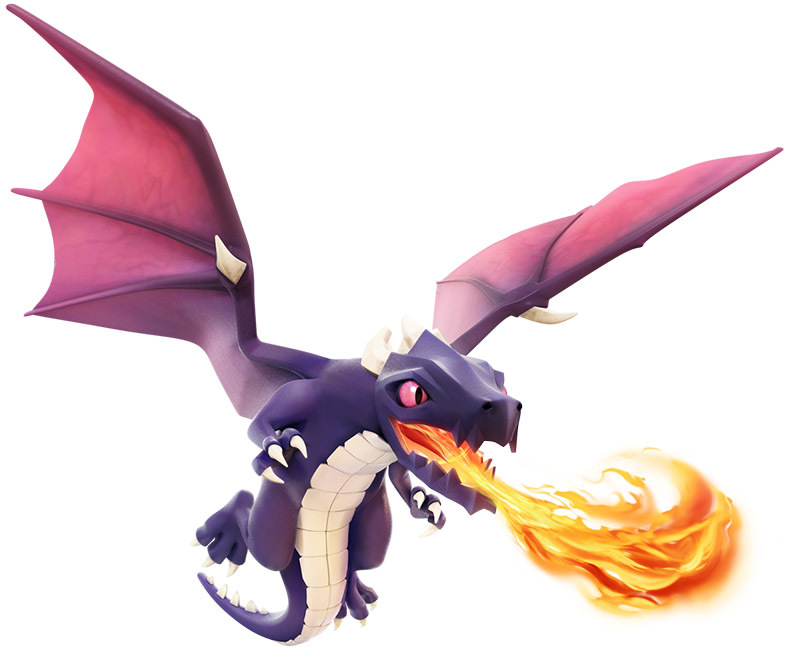 However, no levels of Dragons are trained or upgraded using Dark Elixir. You did not mention the baby dragon.